You're stuck. The bigger your subscriber base becomes, the more expensive it is to communicate with them. What if you can send without worrying about cost or delivery ability? The Send Vine application lets you send traceable emails via our Amazon Simple Email Service (SES). This makes it possible for you to send authenticated bulk emails at an insanely low price without sacrificing delivery ability. The Send Vine sends fast multi-threaded emails via Amazon SES. Free yourself from paying for expensive email campaigns and forget about limits set by your host while at the same time enjoy high deliverability rate. Best bang for your buck! See results of every campaign and autoresponders in a beautifully formatted report. Visualize opens, clicks, bounces, complaints and countries with charts & data. 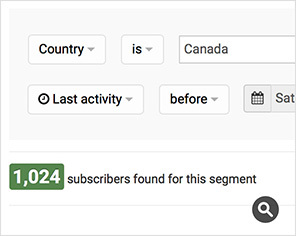 You can export segments of subscribers from your report for re-targeting. Research shows sending emails to targeted segments can increase email engagement as well as revenue by more than 25%. The Send Vine enables you to create segments for any list based on any conditions you define. Choose segments and/or lists to include or exclude in your email campaigns for optimized results. Manage and segment lists & subscribers easily with The Send Vine. Mass import/delete subscribers, custom fields, single/double opt-in, custom subscribe/unsubscribe confirmation page, thank you/good bye emails, subscribe form to add users. Want to take our software for a test drive before you buy? Please LIKE or TWEET our page. You will be able to view our demo. Please be advised that we have disabled the sending of campaigns for this demo. To login, just hit Sign in.